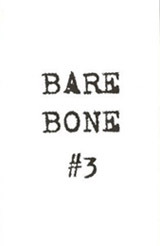 Bare Bone - ZineWiki - the history and culture of zines, independent media and the small press. Bare Bone was a science fiction and fantasy zine edited by Kevin L. Donihe. The first four issues were published by Donihe from Kingsport, Tennessee, U.S.A.; subsequent issues were published by Raw Dog Screaming Press in Hyattsville, Maryland, U.S.A.
At least eleven issues were published, the first in 2001 and the eleventh in 2009. Bare Bone featured fiction by Lawrence Barker, Bruce Boston, Donna Taylor Burgess (The Blue Lady), Donald R. Burleson, Mollie Burleson, J.R. Cain, Tim Curran, Stefano Donati, James S. Dorr, Denise Dumars (Dumars Reviews), Robert Dunbar, Tim Emswiler, Kendall Evans, Paul Finch, Jack Fisher (Flesh & Blood), C.S. Fuqua, C.J. Henderson, Gerard Daniel Houarner, Rhys Hughes, Mark Justice, D.F. Lewis (Nemonymous), Bentley Little, Phil Locascio, Nick Mamatas, Ardath Mayhar, Mark McLaughlin (The Urbanite), Yvonne Navarro, Kurt Newton, Tom Piccirilli (Epitaph), John Platt, John B. Rosenman (SPWAO Newsletter), Jasmine Sailing (Cyber-Psychos AOD), Ekaterina Sedia, Craig Sernotti, Simon Stranzas, Jeffrey Thomas, Paul A. Toth, Scott H. Urban (Frisson), Don Webb, D. Harlan Wilson, David Niall Wilson, Lee Clark Zumpe, and others. Poetry came from Michael Arnzen, Nancy Bennett, John Benson (Not One Of Us), Lida Broadhurst, Cathy Buburuz (Champagne Horror), Donna Taylor Burgess, Tyree Campbell (Illumen), G.O. Clark, Holly Day, Corrine DeWinter, Denise Dumars, Wayne Edwards (Palace Corbie), Kendall Evans, John Grey, K.S. Hardy, Dwight E. Humphries, Charlee Jacob, Pugnacious Jones, David C. Kopaska-Merkel (Dreams and Nightmares), John Edward Lawson, Donna Lynch, Cindy Main, Joy Marchand, Mark McLaughlin, Kurt Newton, Karen R. Porter, Wendy Rathbone, Tina Reigel, William P. Robertson, Ann K. Schwader, Craig Sernotti, Marge B. Simon (Star*Line), Christina Sng, Susan Liev Taylor, Steve Rasnic Tem (Umbral), Scott H. Urban, Thomas Zimmerman, and others. This page was last modified on 24 October 2012, at 14:40.